My dad makes the very best cured salmon - gravad lax - that I've ever had. He'll make it for Christmas and Easter, and this year, I asked to join him so I can document the process. It's very easy, but not quick - it needs a few days to cure, and then he always freezes it. You can freeze it beforehand for at least three days, but he always freezes it in convenient portions once the curing is done. 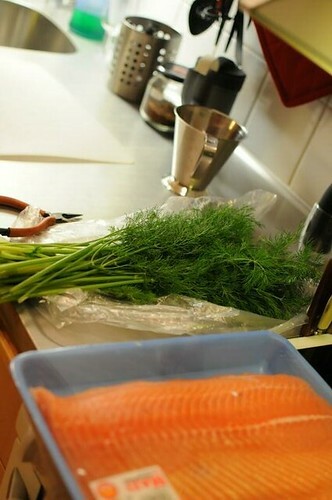 You serve this with Hovmästarsås - a dill-mustard sauce that is very easy to make yourself. 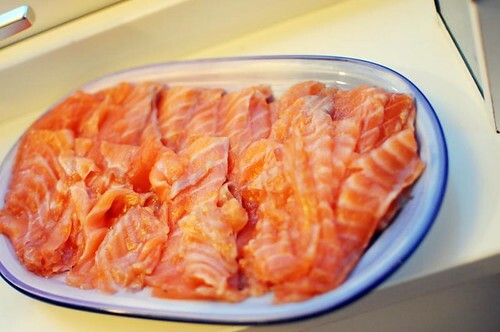 First, get yourself a nice piece of salmon fillet, fresh and skin-on. (A middle piece is best, the tail end is too thin.) 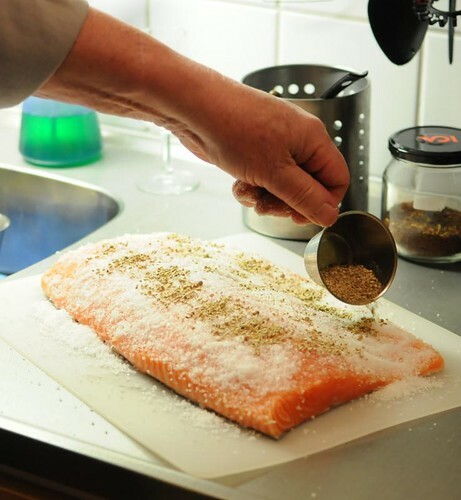 For 1 kilo of salmon, you need 50 ml of coarse salt (iodine-free), 100 ml of sugar and one tablespoon of crushed white pepper. And a large bunch of fresh dill. 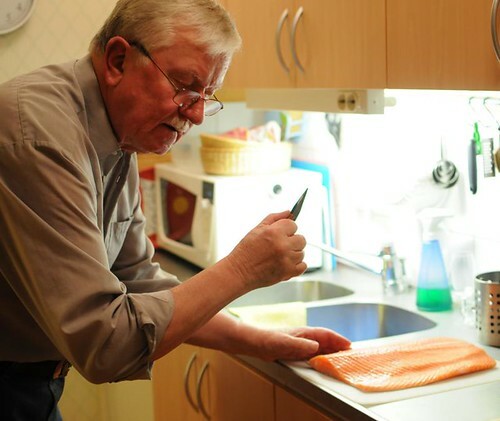 Run your fingers over the fish to detect any remaining pin bones, and pull those out using tweezers. 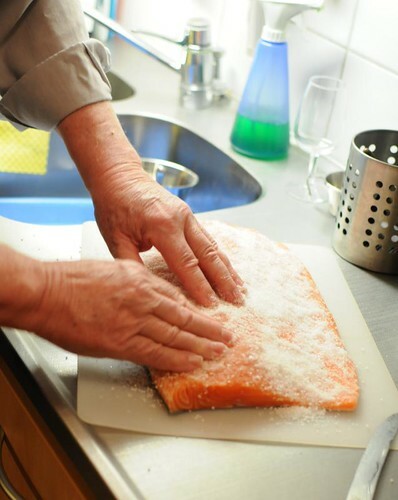 Mix salt and sugar, and rub it into the salmon. Grind white pepper in a pestle, and rub that in, too. 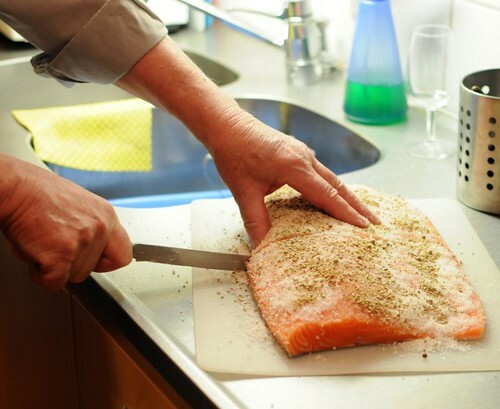 Cut the salmon in half. 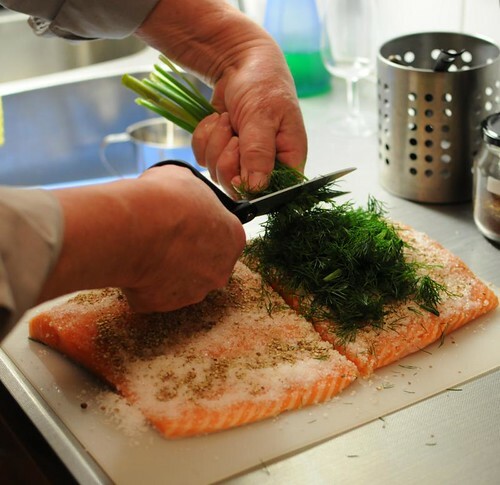 Cover one half with finely cut fresh dill, and top with the other piece, which you turn i180 degrees, so that the thinner end will match up with the thicker end. Press down so it's nice and tight. 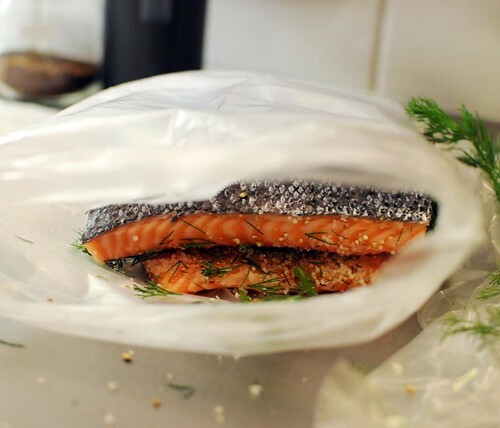 Seal in double plastic bags, and place in a suitable dish. Place in the fridge for 48 hours. Turn it every morning and evening. After that, it's done. 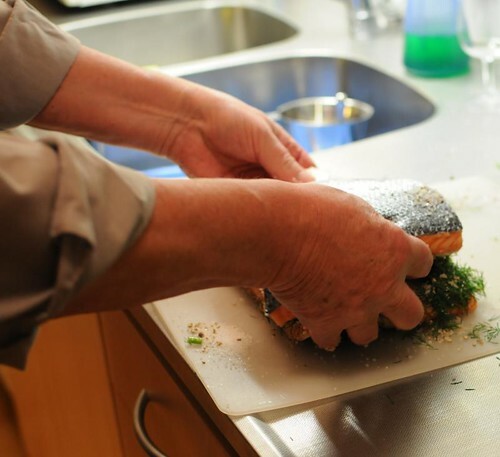 Scrape off all the dill and any remaining spices, and cut into smaller pieces - the large piece in the photos became four smaller strips. (Two from each half.) Wrap tightly with plastic and freeze. Thaw overnight in the fridge. I've never used the cut-in-half and stack approach, but will try this next time. your dad is adorable, by the way! God jul och tack för en bra blog. Jag vill önska dig och de dina en riktigt god jul! Is the freezing an essential part of the process, or is it a means of storage? Robyn, it's not really part of the cooking process, but done for safety - the Swedish version of FDA recommends it, to kill off parasites. It should be frozen for at least three days, either before or after the curing.